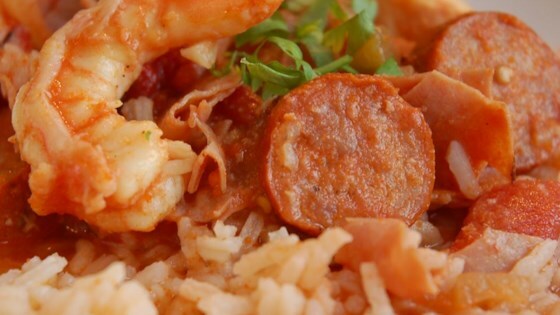 "Impress your family and friends when you serve this classic and flavorful Creole dish and best of all, it's easily made in the oven. I brought a huge roaster pan full to a neighborhood fish fry and needless to say, there were no leftovers. Follow the link for the Creole Seasoning Blend, and make your very own seasoning!" Get the recipe for Creole Seasoning Blend. This was good. I just threw everything into the slow cooker except the rice, let it cook for a couple of hours, added the rice and cooked until the rice was done. OUTSTANDING!!!! Easy and delicious. I cut the recipe in half and fed my family of 5 with enough leftover for lunch for my husband and myself.